Hey everyone and welcome to the monthly recap PSE article. Here you will be able to know what happened in the last month in Power Soccer, so keep reading! Chat Admins (CA): topaz97 (United States), skilly_bully (India), robbie.o. (Germany) and lokmen05 (Poland). Forum Admins (FA): hubalczyk (Poland). Reporters (RA): razor-edge (Argentina) and naruto_ball_irc (Colombia). Two former MAs returned as CAs: lokmen05 y robbie.o. Also, hubalczyk, the Polish admin has become a CFA. Also we were able to see naruto_ball_irc’s (former CA and FA) return. 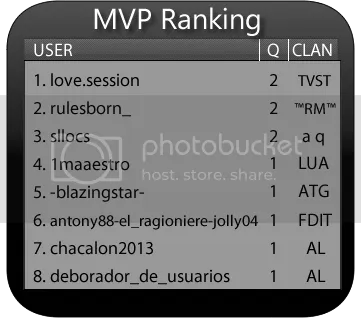 The Romanian user love.session became inactive and, therefore, disappeared from the individual ranking. welcome_qx_xp_joker_star_, who had been in the first position about a year ago, did a very good job and returned to that spot. The Brazilian rulesborn_ occupies the second position with ten RPs less than him, so things can change at any time. 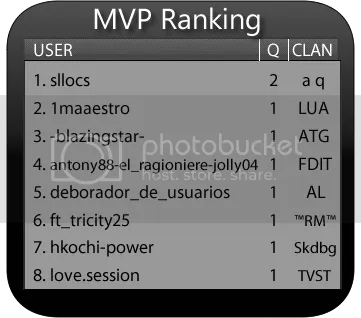 As regards -blazingstar- of Germany, he maintained his position since last month after being very active, especially in clan cups. 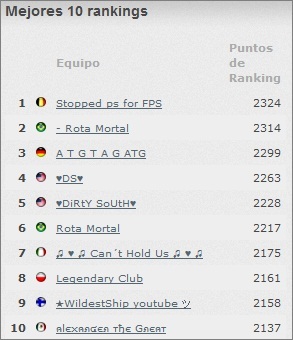 Finally, e_pic and biggy0003 are battling again and will surely be trying to get to the top spot. In Power Soccer’s history there has never been a clan that remained for a year or more in the first position. Many users thought Alexander the Great would break that record, but no, they did not. Although that now we can see them above in the Top 10, in the middle of August they were surpassed by World of Brothers, who currently occupy the last place on the podium. 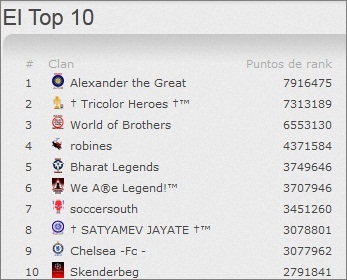 † Tricolor Heroes †™, one of the newest members of the prestigious Clan League, are located in the second place. 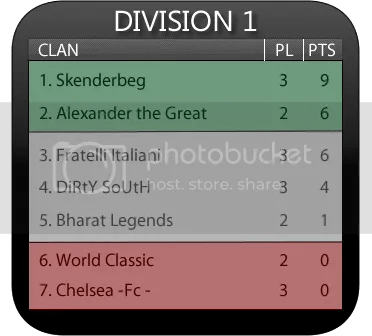 Skenderbeg has been hovering in Top 10’s last places in this thirty day period, therefore we can say that, despite being a powerful clan, they are not as good as before. DiRtY SoUtH had a month of low activity and that is the reason for their current position in the ranking. It is remarkable robines’ return to “the list” and the appearance of soccersouth, a clan formed by a legion of new players which will undoubtedly give plenty to talk about. What is new in Power Soccer? Clan league’s second season has begun: this great competition has already kicked off. Note that this time the league will last only three weeks, which means that there will be two cups per week. Visit the Clans League’s page and find out when your clan will play! Summer Trophy 2013 has finished: Romanian user elvispresley77 beat reprezentant_polski in the final round of this exciting tournament that had over 11,000 participants. He received a club membership for a length of six months. 99 Cup: the contest has been extended: as from now, the best ten users in each 99 Cup will be given points and a list with them will be made. The first three of that list, at the end of the year, will receive impressive prizes that you cannot get at store. PSI/PSE – Contest [Important]: Crew together with PSI and PSE people have organized a contest for people to have fun in it and win prizes. Get to know everything about this topic by reading the PSE articles about this: Part I, Part II and Part III. Forum Champion Award – Rebirthed: HFMA jefco decided to bring this contest up again. Each three months some forumers will be nominated, and the winner (chosen by the people) will get 1000 tickets and a special cup or tournament in his name. This has been the monthly recap. We have gone through the major events of August, I hope you enjoyed the article. See you next time! Welcome to the 3rd edition of the Clan League Weekly Recap series, where every week, we update you on all the newest, and most exciting CL news. Two heart-stopping weeks have left us on a mind-blowing cliff hanger. The competition is tight, all teams making a great effort, striving to reach the peak of the table in their division, but only one clan per division will do that (plus the runners up), consequently causing the first edition of the Clan League to be took to the extreme. A drum-roll would be preferable right now, but as there is none, then I guess we’d better get on with re-capping the last game week! Halfway through the clan league, each division is still up for grabs, any clan could win it! It seems that the majority of clans have gotten themselves above the relegation zones with wins, while for some, there is plenty of work left to do. Once again, I’d like to point out that we are halfway through the clan league already, so it would only be fair to mention the leading clans at the halfway stage. They are Skenderbeg, Rota Mortal and ╬ẴLIAЛZA►▼◄LAŤIЛA╬™. So far, these three clans have been dominant, none of them losing a single match so far in the league. Will they be able to continue their winning ways, or will the pressure of dominance get to them? We are now entering the heated stages of the competition, all the clans will surely be feeling the pressure, as will they be attempting to strive to victory. Next week, titans will clash as the top two teams from division 1, and the two top teams from division 3, go head to head, in matches which may possibly be decisive in who the victor will be. I just can’t wait a second longer to find out who will prosper! Hey guys, welcome to the 2nd ever edition of the CL Weekly Recap. As you can tell by the title, this article will be focusing on the 2nd game week of the clan league, where we are currently in season one. So, without further a-do, lets get on to recapping the last game week! So, after the second game week, tables show that each division is still extremely tight. The current leaders are Skenderbeg, Rota Mortal and robines, though nobody knows who will prosper and end up victorious when all is said and done. Notably, the highest win of the week was the astonishing scoreline of 52-7 that Rota Mortal achieved against World Of Brothers, though this doesn’t at all mean that WBWB are out of the competition, as the unpredictable nature of the Clan League insists. So, after another successful and exciting week of the Clan League, we are all left anticipating the obvious. What will happen next, who will prosper, will we be able to choose a clear winner? We’ll have to endure an anxious wait, as next week ponders. What do you think will happen, and what do you make of this weeks results? That’s all chaps! Check back here next week for another update! Ciao. Funniest Goal Contest – Held by me and Dad65, entries being judged and winners will be announced later. Goal Of The Month – girl8888 wins the Februrary contest with an amazing overhead kick, March contest is being judged right now and the contest for April is on right now and you can enter your goal here. PSG are holding 2 contests, “Most Active User” and “Best Badge ratings”. The contest starts from April and you can get more information in this thread. PS – World Cup 1st Edition – Contest is unfortunately over now, it was a tough contest, and yes even I participated :P. The winner in the end was skilly_bully beating gamer009 7-2 in a 0.4+ ping game. For 3rd place, bennaidu will play against jennifer.lopez, find out more here. skilly_bully is on a CM giveaway frenzy, with holding his own contests in the offside section. The first contest is about Predicting which team will win the match in IPL (Indian Premiere League – Cricket). The second contest is a Quiz about PS and General Knowledge. 3 Months CM Contest – Amontiliadito is still waiting for more entries and the prize is something the hard work is surely worth for! All you have to do is just write a short essay about your town and include some pictures. After the success of Ireland Cup event, ATG winning it with their 4 star players and -blazingstar- with the MVP. RPA (Romanian Poison Angels) have decided to celebrate their 3 years of activity and hold a similar clan cup event this Sunday 6PM CET. 15 day market player and few hundred tickets up for grabs for the winner clan and additonal 1 motnh CM for the cup MVP! Easter Classic Tournament! – Yes, the Easter Classic tournament is back on and under way! Previously it was cancelled due to too few participants. The winner will get “Colin Wakefield” for 2 months, 300xp and 30 tokens!!! Not only that, the winner also gets a chance to play a match with PS Producer Powdersnow, and if they win the match, they will win 3 months CM!! !